***Even heard of Hard Tail clothes? I have and they are AMAZING. Leslie Loves Veggies is doing a giveaway to Yoga Clothing for a $50 Gift card to buy something from Hard Tail. Enter here! ***Here is another awesome giveaway for a $50 gift card to Handbag Heaven on Boobies, Babies, and a Blog. Enter here! Peeled Snacks sent me some of their organic dried fruit for review. I love dried fruit so as soon as I opened this package, I opened a package of the dried pineapple. It was different than any other dried pineapple I have ever had because it does not have any added sugar. I liked it better than other kinds. Also, the dried cherries are awesome! They are nice and tarte! I was not a fan of the dried apricots. They had a funny taste to me so I will probably put them in my oatmeal or something. These snacks are sold in Starbucks through the US and Canada! Giveaway: Peeled Snacks is going to be giving away one Tropical Organic Mix which contains 9 snacks: 3 each of pine-4-Pineapple, much-ado-about-Mango & Banan-a-peel to one lucky reader from the US. The giveaway is open until Midnight on Sunday August 29th. Winner will be chosen on Monday August 30th using Random.org. 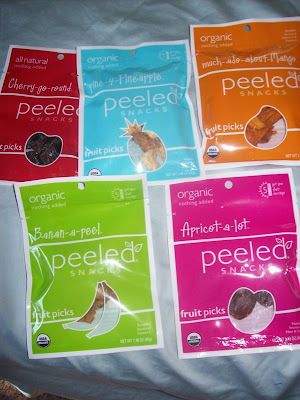 Mandatory: Visit the Peeled Snacks website and let me know what kind of dried fruit sounds the best to you! -Like Peeled Snacks on Facebook (1 entry). -Follow Peeled Snacks on Twitter (1 entry). Great blog! Came across your site from one of the blog hops- I am now following you. Feel free to follow back if you like!! The Cherry-go-round Sounds the Best! dried banana sounds good to me! those are great! i had them before : ) CHEERS! Thanks for following me, I'm following you back. Can't wait to read more from your site. Thanks for dropping by my blog, I am now following you back. Have an awesome week! Hi, I am following you back from FMBT. Thanks for checking out my blog and I look forward to reading more. Thanks for coming by and following. I'm following you back. "Apple 2 the core" sounds good! Pinapple sounds good as a dried fruit. Learned about you from your comment on my blog. Pineapple would be the BEST flavour. I entered the Mediterranean Snack food giveaway. The banana flavor sounds best! Liked Peeled Snacks on Facebook! Following Peeled Snacks on Twitter! apricot-a-lot sounds best, but I'd try 'em all...they look GREAT :) and I love dried fruit!